He was born in Athens in 1964. He holds a BSc in Electrical and Electronic Engineering from John Moores University in Liverpool as well as an MSc in Digital Electronics from the University of Manchester Institute of Science and Technology (UMIST). 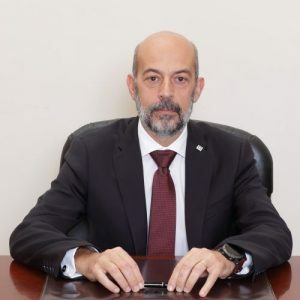 He joined Alpha Bank in November 2016 as Executive General Manager.He has more than 20 years of experience in the field of Telecommunications and particularly in the area of Commercial Operations, serving as a c-level Executive at all 3 mobile operators in Greece. More specifically, from 1998 until 2005 he worked at Cosmote as a Product and Services Manager and then he assumed the General Management of the sector. From 2005 – 2009 he joined WIND Hellas as Chief Commercial Officer, while later he assumed the responsibilities of the Chief Operating Officer. During 2009 until 2012 he was the Chief Operating Officer at Vodafone Hellas.In 2012 he was appointed Group Chief Operating Officer at National Bank of Greece and a Member of the Executive Committee of the bank.Throughout his career Mr. Charalampidis served as a BoD member in various companies such as: OTENET (ISP Provider), TELLAS S.A. (Fixed Line Operator), ZELITRON (IoT Internet of Things), Ethnodata (IT service provider), CosmoONE (B2B e-Auction service provider).He is also a member of IET (Institute of Electrical and Technical Engineers) and he has served as a chairman of its Greek section for several years.